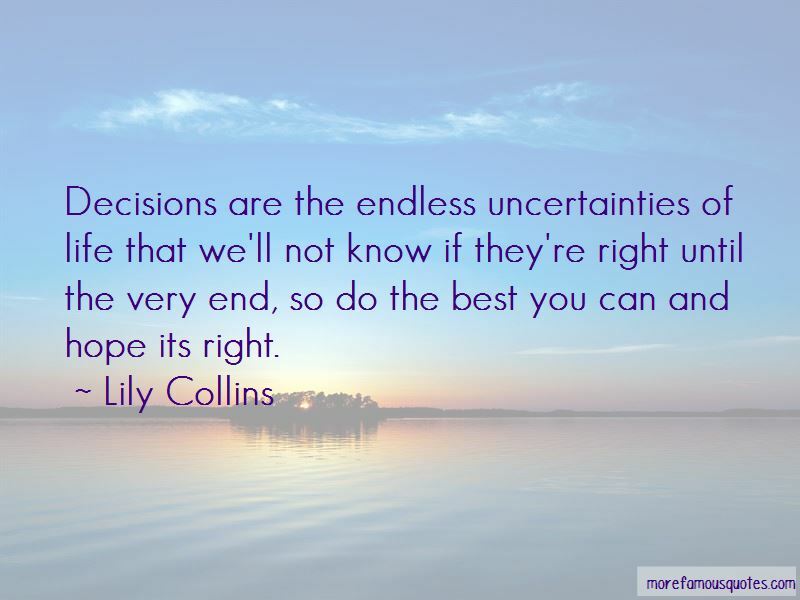 Enjoy the top 74 famous quotes, sayings and quotations by Lily Collins. My parents read me fairy tales every night and I used to believe I was a fairytale princess, like every young girl. I had all the Disney dressing-up costumes and would play every character. Everything for me has happened so quickly. I finished shooting 'The Blind Side' not this past June, but the June before, and all of sudden up to now, it seems like it's gone from zero to 60 for me. I feel so fortunate to be able to say that. My last name may have opened doors, but I have to keep them open. When it comes to the work, I'm excited to see what people think. When it comes to the private life, that's when I don't pay attention. I sing some songs but don't expect me to release an album anytime soon. I don't know if this is too weird to say, but this is completely surreal for me. Bizarre. The cover of 'Teen Vogue' has been on my bucket list forever. I was actually the one who decided to move to LA. Mom and I were driving on Sunset Boulevard during one of our trips back to see her family, and I said, 'Can we just stay?' So we did. At first, I didn't hang out with celebrity kids. That wasn't the way I was brought up. I went to a run-of-the-mill Catholic primary school when we first moved to L.A. But then I went to a high school where there were lots of 'industry' children. Those weren't my best friends and I've never set out to make myself a part of that scene. I don't like reading things that people say on the Internet because I know so much of it is not true. I don't want to waste my time worrying about what other people are thinking. I just want to focus on being able to do cool projects. To look into that persons eyes and find yourself so completely lost in another world, a world full of absolute comfort and happiness. No matter what, I need to maintain my sense of self and always be true to who I am. I like to think of myself as a very passionate person, and as very determined. So, if I set my mind on something, I definitely stop at no end to find within myself the power to keep going, whether that involves thinking of a new approach to a problem, or physically challenging myself. I don't wear dresses all the time - it's nice to save those moments for certain occasions and to make it feel extra special. I love clothes, but I don't have a specific favorite, because I'm very much a fashionista. Definitely with the fit of clothing - how it really depends on mere centimeters and millimeters of difference in terms of how lengths can make such a big impact on your shape. I learned how to incorporate a cute peter pan collar on a dress and not make it look juvenile. I don't really have a favorite song. Music is such a big part of who I am, and speaks to so many different emotions inside me, that I don't have an all-time favorite. Want to see more pictures of Lily Collins quotes? Click on image of Lily Collins quotes to view full size.